This page is dedicated to Steve's Pontiac Grand AM GT, and all the car shows he will soon be entering. 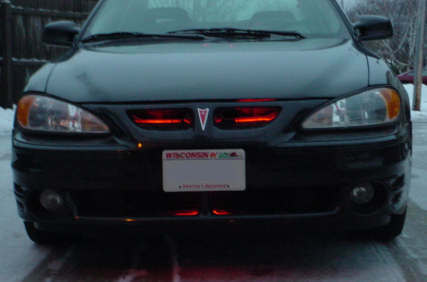 You'll find below a link to the Gallery of all the pics of his Pontiac GT. You'll also soon see a link to another Gallery with pictures of all the car shows he will be entering. Sales & Editorial Representatives please click here. We will be following this Pontiac in all its "Glee" to various car shows across America, so stay "Tuned". They once said that there was nothing like the big old Detroit cars with the huge 400-cubic-inch donk under the hood. Now days, muscle cars are far more refined. This Grand Am's V6 engine is slightly over half the size of these gas-guzzling screamers, and can now match even the biggest engine's with equal performance. Steve's Pontiac GT is also set up to perform dragraces and is now one of the fastest cars in its ranks - it's running high 14's and low 15's for the quarter mile. Coupled with the bright Neon and LED lights that we have supplied for Steven's Pontiac, and its "un-matched" Sports Car Characteristics, you have before you - one heck of "Dragging show car" that is Certain to Dominate the Floor of any car show it enters. 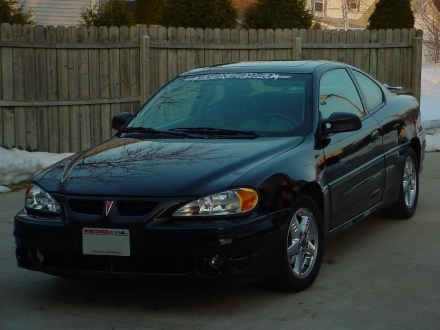 We are very proud to have had the privilege of Sponsoring Steven and his Pontiac Grand AM GT. Thankyou Steven for this Wonderful Opportunity. Click Here to go to the Gallery featuring Steve's "Detailed" Pontiac. (please give this page a few moments to fully load) Thankyou.